A range of large diameter two wing cutters in ½" shank to produce raised panels. The cutters are supplied with guide bearings which may be removed to increase the tongue length dimension "E". A back cutter kit is available to fit this range of cutters which will rebate the back of the panel and leave a 6mm tongue (click Spare & Optional Parts... for more information). N.B. 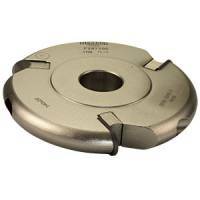 THESE ARE LARGE DIAMETER CUTTERS FOR USE IN FIXED HEAD MACHINES ONLY AND AT 12,000 rpm MAXIMUM SPEED.